The escape room attendees find themselves locked inside of a freezing, winter themed room where they have to melt a block of ice to retrieve a key. 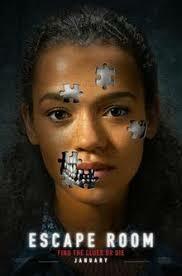 The Escape Room movie poster features main character Zoey (Taylor Russell), with jigsaw pieces taken out of her skin revealing a menacing skull underneath. Taking place in our beloved hometown of Chicago, “Escape Room” centers around six people who have all been invited to participate in an “inescapable escape room”. Motivated by a $10,000 prize, all six show up and quickly realize that they are fighting for much more than the cash: they are escaping for their lives. Starting off in the waiting room area, the attendees discover that the room they are in is actually the first one they need to escape. The temperature starts to rise as the walls begin to resemble the inside of an oven, the once calm and peaceful setting turning into a blazing inferno. As the rooms progress on, they become more and more dangerous, the most memorable including an upside-down bar where the ceiling tiles drop out revealing an elevator shaft, a freezing arctic landscape with thin, cracking ice, a psychedelic TV room, and a final shrinking, claustrophobia-inducing office room. The movie spends an excessive amount of time establishing the unnecessary backstories of three of the main characters, making the deaths and twists in the movie extremely predictable and unsurprising to the audience. It relies on cheap jump scares and flashbacks to try and keep viewers on the edge of their seat, but falls extremely short of doing so. As an avid fan of the “Saw” series, I couldn’t help but feel like “Escape Room” was a watered-down version of the infamous hepatology. The premise of having to escape a room to avoid being killed by an evil game-master felt all too familiar, and as the movie progressed on and the themed escape rooms started to look more and more like traps, I couldn’t help but get a feeling of deja vu. I was hoping this movie would be the breath of fresh air the “Saw”-esque horror sub-genre neede as it adds a modern twist of an escape room, but it instead completely misses the mark and is nothing more than a knockoff of the franchise. In their defense, I can see where the writers and directors tried to put their own spin on the sub-genre, by focusing the movie on the clues instead of escaping Jigsaw-esque death traps, but, I was extremely disappointed by the utter lack of complex riddles and the relatively simple rooms. In the first room, Zoey (Taylor Russell), discovers that a broken doorknob is actually an oven knob and turns it to 451 degrees after the book Fahrenheit 451 is found on one of the waiting room tables. I was completely dumbfounded by this scene; how could the first clue in an “inescapable escape room” be this easy? As I continued to watch, I was further disappointed by the lack of complex and thrilling clues that I expected from this movie and was rather taken aback; one of the rooms didn’t have a single clue. In the black and white TV room, the characters manage to get drugged from a porthole they opened on the floor and clumsily flail around the room until one of them punches a wall and finds an antidote, which is eerily similar to the plot line of “Saw II”. 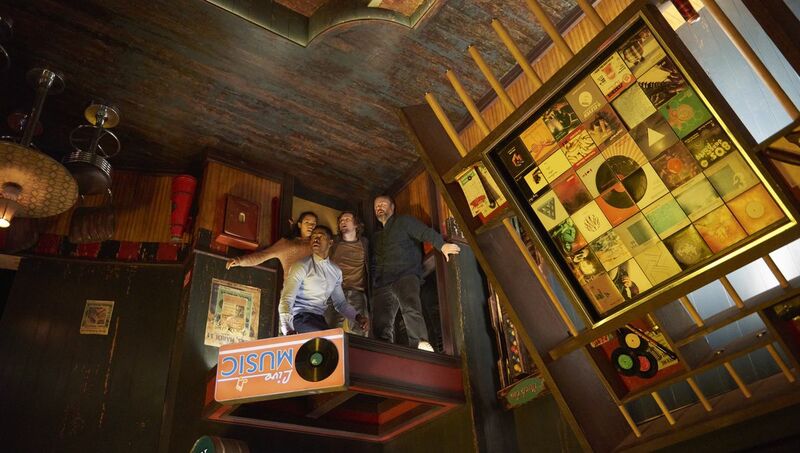 The upside down bar room was one of the most impressive rooms in the movie but the attention was placed on the falling ceiling tiles instead of the clues. At the start of “Escape Room”, I had a lot of hope for the movie. Although the lengthy backstories provided for half of the main characters was really slow, it made me excited to see how the movie would unfold and how the different character archetypes would work together to solve the clues. Yet, as the movie progressed on, I quickly lost my enthusiasm. By the end, none of the questions that sat in the back of the viewers’ minds were answered and the ending was so obscure and open-ended that it was obvious that they were hoping to make a sequel. If you plan on seeing “Escape Room”, make sure you locate the nearest exit before you take your seat, because you might find yourself wanting to escape the theater.